Conservationists in Torquay have turned marine waste into thought-provoking art. 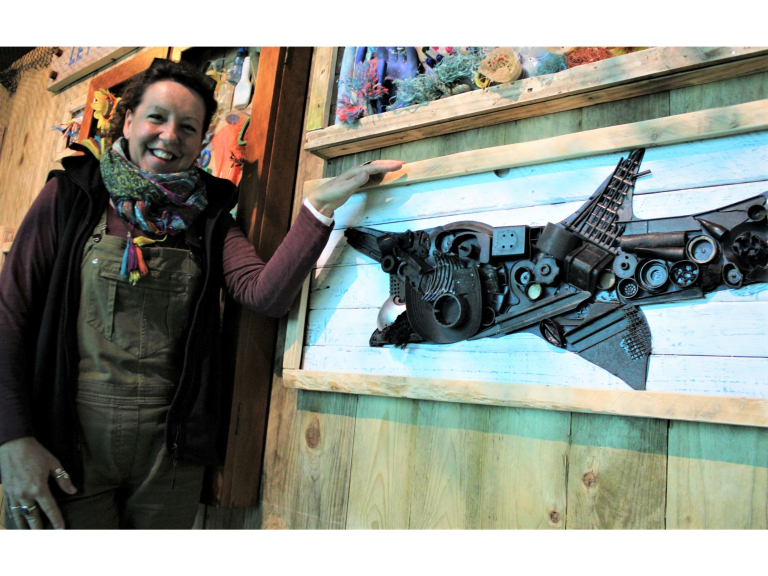 A new installation at Living Coasts, Torquay’s coastal zoo and aquarium, combines education, plastic waste and inspirational creativity. And for zoo artist Jackie Kidd, the task has turned into an obsession - and a new hobby. Initial ideas from zoo staff were developed by Jackie: “I researched the topic to develop the visuals for the background mural. I wanted to make good use of the unusual space - it should visually take you on a journey through the different ocean environments that plastics affect. “The main idea was to create sea creatures out of plastic waste collected from local beaches. As the project progressed, the plastic began to inspire the art. I found I could look at the sorted pieces and see a jellyfish or underwater scene in the colour, shape and texture of the plastic. The area is currently known as Coasts at Risk or the underwater seal viewing area. The new name will be ‘Let’s turn the tide’ in line with the title of the zoo’s plastics campaign. She collected plastics from beaches in East Devon, near where she lives. “I went to Exmouth, Sandy Bay, Ladram Bay, Sidmouth and Weston Mouth near Branscombe. The next Living Coasts beach clean is on Saturday 12th May on Preston Beach, Paignton, between 9.00a.m. and 11.00a.m. Earth Hour, on 24th March, is when millions of people around the planet unite to act for the environment. Many places such as Sydney Opera House, the Eiffel Tower switch off their lights at a given time to mark the occasion. Part of Earth Hour is about making a pledge to tackle an environmental issue.https://www.wwf.org.uk/earthhour?pc=EKN005001 #EarthHourUK. For more information go to www.livingcoasts.org.uk or ring 01803 202470.